We have been in business serving Billings, MT for 9 years! Thank you to all our customers for supporting us! WE HAVE RELOCATED and are OPEN FOR BUSINESS AT THE NEW ADDRESS! Stop by to check out our large fabric selection! We are enjoying the Husqvarna Viking machines and accessories being all in one place! The new Designer Fabric Frame is up and running ready for you to try out! We have it set up for sit down quilting, BUT it can be raised for stand up too. The Fabric Frame works similar to a large quilting hoop, letting you quilt one section at a time. Quilt as large as queen or king/ as small as a baby quilt all on this space-saving 4 1/2 foot frame. Imagine using just 4 1/2 feet for your quilting! You need to come in and check it out! Searching for a quilting and sewing supply shop with a comprehensive list of fabric, sewing accessories and classes. Look no further than Spring Blossom Quilt N Sew, Billings Heights, MT choice for all your quilting and sewing needs for over 10 years. Spring Blossom Quilt N Sew is a licensed Husqvarna VIKING sewing machine dealer. You can also find all the Oreck vacuum and AccuQuilt GO! products your heart desires lining the shelves. If you’re in need of long arm, you can find one for sale or rent at Spring Blossom Quilt N Sew. Every Sewing & Quilting Accessories in One Place! 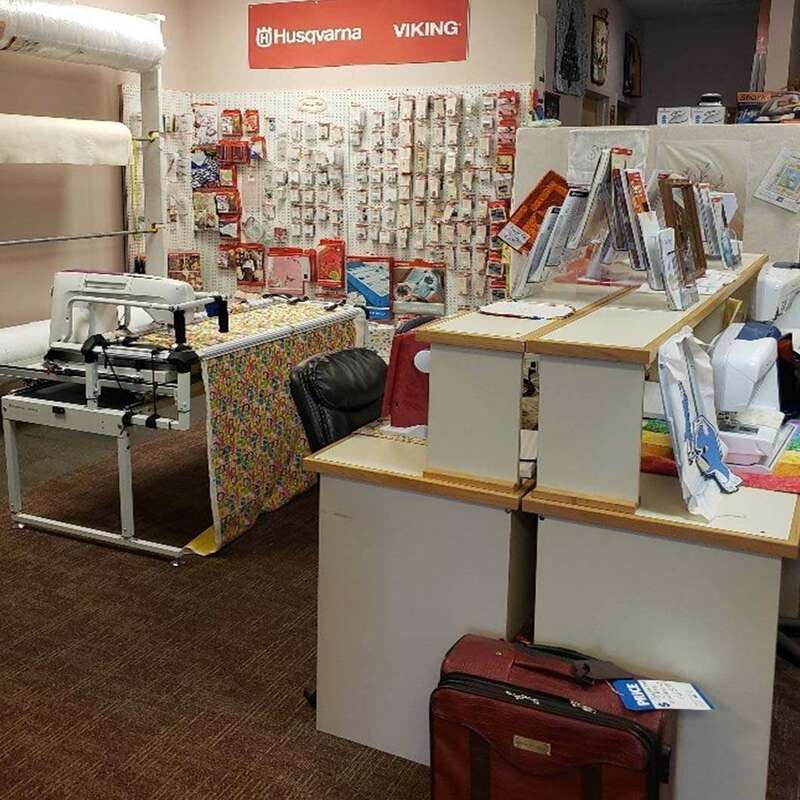 Spring Blossom Quilt N Sew is a full service quilting and sewing shop dedicated to meeting all of your needs so you don't have to run around town searching for the correct piece of equipment or the perfect swatch of fabric. We carry a variety of fabrics and always have crochet supplies stocked and ready to go. You can also find yarn, knitting needles, sewing machine needles, thread and many other notions and essentials on our shelves. If you're looking to expand your skill set, we offer quilting and sewing classes from a qualified instructor, so come on in and start making a beautiful quilt among other things to enjoy. Call or visit Spring Blossom Quilt N Sew in Billings Heights, MT today to browse our machines, fabric and supplies. We look forward to seeing you! As a partner of Oreck, we offer annual warranty service and general service! Our gift corner is a young girl’s dream! We keep a slew of affordable adorable doll clothes (for 15" and 18" dolls! ), shoes and accessories in stock for you to browse at your convenience. You can also peruse our collection of embroidered wall hangings, table toppers, ear warmers and an array of other products. If you’re searching for the perfect gift for a special occasion, consider purchasing a gift card! CONGRATULATIONS Ruth Ann brought in the first Row by Row quilt finished! We are very happy and proud to be displaying it at the store for the next few weeks. It is even better "in person". Come in and check it out! Copyright © 2019 Spring Blossom Quilt N Sew, all rights reserved.